First print off the letters. You can download my uppercase and lowercase letters here. Next I used a 1 1/2″ circle punch to cut out my letters, but you can also use scissors! Then I ran them through the Xyron Sticker Maker. 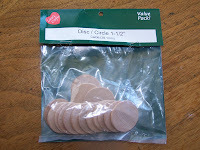 I then stuck them onto 1 1/2″ wooden disks. I know some people Modge Podge the disks when done, but I didn’t and they seem to be holding up fine. Well, that’s it! Super easy and fun! Now go visit my alphabet ideas and have fun learning your letters! I don't laminate the bottle caps themselves, just the page with the picture that they go on. I don't think the xyron sticker maker stuff would stick to the letters if they were laminated first. Some people modge podge the letter disks too instead of using the xyron.You probably don't have to laminate the picture card either if you don't want to. Hi, sorry, I actually cut the letters into strips then used the circle punch to cut them out. I re-made the file though and spread the letters out so its easier for everyone, sorry! Download the link again, hope this one works better. Let me know! Thanks! I just came across your blog (from a post on the Homeschool Share forum) and I have to say WOW! And THANK YOU! I have a pre-Ker, and I can hardly wait to start using some of your ideas! Thanks so much! yes, I should've finished reading instead of jumping into this! LOL. spray adhesive does not work! I will have to go dig out my sticker maker….thanks for posting how to do this. thank you for all your pre k posts! such great ideas!! I am going to start pre k with my daughter in jan.
Would the letters hold up, if you just laminated them front and back and cut them out? Or would it be harder for little hands to pick them up? Culbertsons: I think they'd be okay, its not like they take super harsh treatment or anything, but it does make them a little hard to pick up. I laminated them and then cut them out. It would work fine unless you have a child who is a super perfectionist or in my case has autism and gets very frustrated when the letters slide around on the laminated picture so I'm heading to Hobby Lobby tonight to buy the wooden pieces. Love this site! !